Your kids will love singing their hearts out at a karaoke party! Karaoke parties can be a great way for your kids to indulge their pop star fantasies and sing along to their favourite songs. With backing vocals and lyrics provided, all your child needs is an audience! Is a karaoke party right for your kids? 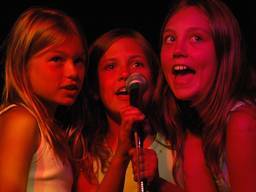 If your child loves to sing and perform, why not give them the opportunity to strut their stuff with a karaoke party? Karaoke parties are best for kids aged six and up, as children need to be able to read at a fairly proficient level to be able to follow the lyrics on the tv screen. Parental supervision is advisable when kids are working a karaoke machine, just in case something breaks. How to arrange a kids' karaoke party! Buy a karaoke game. This is the best and cheapest option, but you will need to already own a games console. Buy a portable kids' karaoke player. These are availableat toy stores or birthday party suppliers, and usually for around $100 each. Keep in mind they usually have a limited range of songs. Great for younger kids! Whether you hire a professional karaoke system, or simply crank up the stereo system and let the kids sing along, you will have plenty of fun and laughter if you host a karaoke party!